The United States Patent and Trademark Office (USPTO) issued patent number 10 million on June 19, 2018. This milestone of human ingenuity perhaps exceeds even the Founding Fathers’ expectations when they called for a patent system in the Constitution to “promote the Progress of Science and useful Arts.” Follow the timeline below for important moments, notable inventors, changing patent designs, and other interesting facts over more than two centuries of innovation in America. Animation: Drawing of George Washington, Henry Knox, Thomas Jefferson and Edmund Randolph. Following passage of the 1790 Patent Act, the first Patent Board, composed of Secretary of State Thomas Jefferson, Secretary of War Henry Knox, and Attorney General Edmund Randolph, begins meeting at regular intervals to examine patents. President George Washington signs the first U.S. patent, granted to Samuel Hopkins for improvements in "the making of pot ash and pearl ash." The Patent Act of 1793 shifts patent examination to a simple but less-protective registration system. Eli Whitney receives U.S. patent no. X72 for a "Cotton Gin." The patent cover becomes a typeset form filled in by a calligrapher but still signed by the president. Cover designs of this period are utilitarian but still reflect the craftsmanship of hand-set type. First superintendent of patents Dr. William Thornton, a polymath who also designed the U.S. Capitol, becomes the first superintendent of patents, later termed "commissioner of patents," and serves for 26 years. The U.S. Patent Office is established in Blodget’s Hotel in Washington, D.C.
William Thornton persuades the British to spare the Patent Office during the burning of Washington, arguing that the knowledge contained within was useful to all mankind. Thomas Jennings receives U.S. patent no. 3,306x for "Dry Scouring," a precursor to dry cleaning. He is the first known African-American to receive a U.S. patent. Patents feature engravings on the cover by William Stone, best known for creating a highly accurate facsimile of the signed Declaration of Independence for the nation’s 50th anniversary. 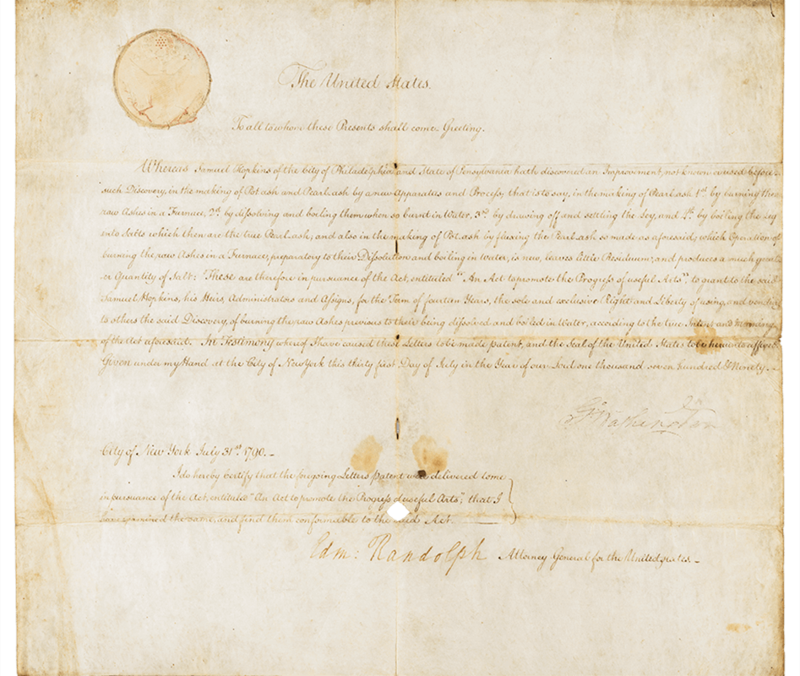 July 4 - The Patent Act of 1836 completely rewrites U.S. patent law. July 5 - Charles M. Keller, who helped Senator John Ruggles write the 1836 Patent Act, is the first person to hold the official title of "patent examiner." Miniature models of the inventions are now required when applying for a patent. 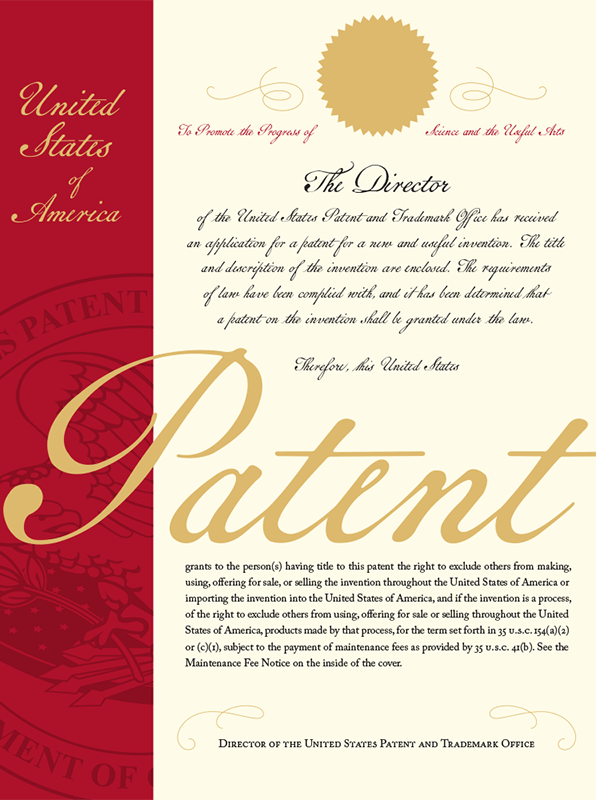 Patent numbers reset On July 11, patent numbers reset and U.S. patent no. 1 is granted to Senator John Ruggles, who also wrote the Patent Act of 1836. On December 15, the Patent Office catches fire, destroying many patent documents and models. An ongoing effort to recover the "X patents" lost in the fire continues to the present day. The elaborate engraving in this example from the Van Buren administration references the scientific and engineering innovation represented by the patent system. An agricultural division, the predecessor to the U.S. Department of Agriculture, is established in the basement of the Patent Office. Samuel Morse receives U.S. patent 1,647 for the telegraph, which allows messages to be sent across long distances. The related alphabetical code, co-invented with Alfred Vail, becomes known as Morse code. The first design patent, "Des. 1" - now called U.S. patent D1 - is granted to industrialist George Bruce for "new printing types." 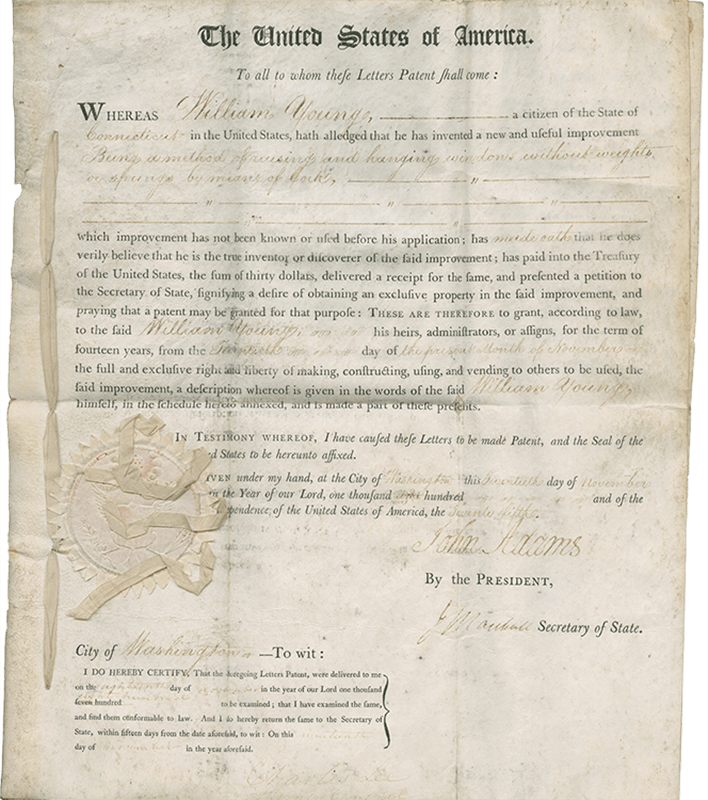 Manner of Buoying Vessels Abraham Lincoln receives U.S. patent no. 6,469 for a "Manner of Buoying Vessels." 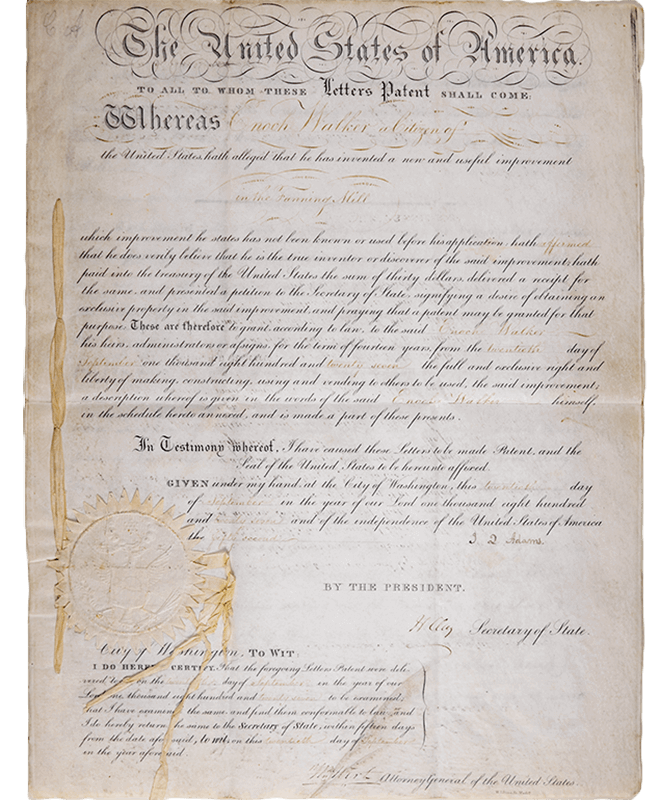 He remains the only U.S. president to hold a patent. Clara Barton Clara Barton works as a clerk at the Patent Office. She is paid equal wages for her work, but after male coworkers complain, she is told to work from home and ultimately loses her job. She is later rehired. That noblest of Washington buildings As a volunteer nurse during the Civil War, poet Walt Whitman works in the makeshift hospital within the Patent Office and describes it as "that noblest of Washington buildings." 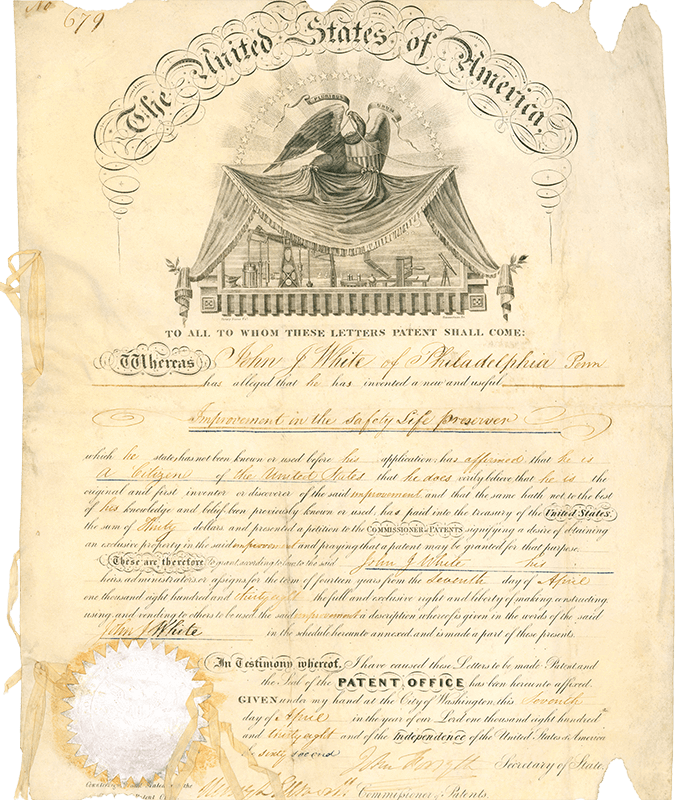 Blank patent covers are typeset in a script face and feature engraved illustrations, often of the Patent Office in Washington, D.C.
Elijah J. McCoy, whose parents were slaves and escaped Kentucky for Canada, receives U.S. patent no. 129,843 for an automatic lubricating device that enabled steam locomotives to run without stopping for lubrication. Legend holds that his invention worked so well that machine operators wary of cheap substitutes often requested "the real McCoy," a phrase still in use today. Granted patents are now published in the Patent Office’s Official Gazette every Tuesday following their issuance. Louis Pasteur receives U.S. patent no. 135,245 for an "Improvement in Brewing Beer and Ale" that lays the basis for modern beer brewing methods. Improvement in Ear-Mufflers Fifteen-year-old Chester Greenwood receives U.S. patent no. 188,292 for "Improvement in Ear-Mufflers." His invention adds a swivel hinge to keep the earmuff tightly against the ear. "Chester Greenwood Day" is still celebrated in his Maine hometown. Second Patent Office fire The Patent Office burns again, destroying many patent models. From this point onward, models are no longer mandatory when applying for a patent but still frequently requested by the commissioner. Otto Heinigke receives the 10,000th U.S. design patent for "Design for Pumps." Statue of Liberty Parisian sculptor Auguste Bartholdi receives U.S. design patent no. 11,023 for a monumental sculpture depicting "Liberty enlightening the world." Thomas Edison receives U.S. patent no. 223,898 for an "Electric Lamp." It is the first commercially viable lightbulb. Edison is the inventor or co-inventor on over 1,000 U.S. patents. The United States joins the Paris Convention, an international treaty that strengthens and harmonizes the protection of patent holders across the world. Nikola Tesla receives U.S. patent no. 381,968 for an "Electro-Magnetic Motor," the basis for modern electric induction motors. Toilet paper roll Seth Wheeler receives U.S. patent no. 459,516 for a toilet paper roll. 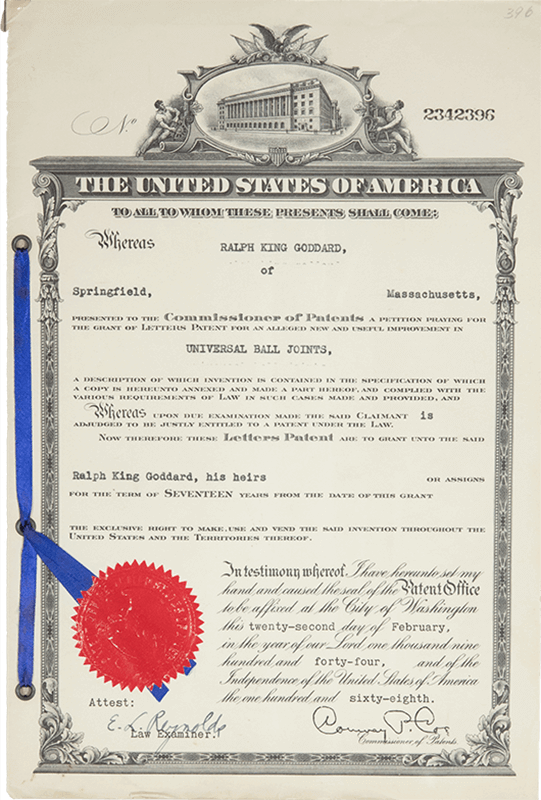 Edward Hyed receives U.S. patent no. 500,000 for a "Combined Flush-Tank and Manhole." This design persists from the beginning of the 20th century through the mid-1980s with only minor changes. Guglielmo Marconi, considered the inventor of the radio, receives U.S. patent no. 757,559 for a "Wireless-Telegraph System." Animation: Wright brother's plane, piloted by Orville Wright, flying across to the right, past Wilbur Wright. Wilbur and Orville Wright receive U.S. patent no. 821,393 for a "Flying-Machine," forever altering the course of human history. They will vigorously defend their patent rights in the years ahead. Francis H. Holton receives U.S. patent no. 1,000,000 for an improvement in vehicle tires. Bottle or similar article Alexander Samuelson receives U.S. design patent no. 48,160 for a "Bottle or Similar Article." The iconic bottle helps Coca-Cola® stand out among competitors. The first Manual of Patent Examination Procedure is published by the Patent and Trademark Office Society. Congress passes the Plant Patent Act, creating a distinct type of patent to protect new varieties of asexually reproduced non-tuber propagated plants. Henry Rosenberg receives U.S. plant patent no. 1 for a "climbing or trailing rose." The rose is named "New Dawn" and remains popular today. Freestone peach Famed horticulturist Luther Burbank, whose work and advocacy for intellectual property rights was the inspiration for passing the Plant Patent Act, posthumously receives U.S. plant patent no. 15 for the freestone peach. Machine for slicing an entire loaf of bread Otto F. Rohwedder receives U.S. patent no. 1,867,377 for a "Machine for slicing an entire loaf of bread at a single operation," and U.S. patent no. 1,816,399 for packaging sliced bread. Joseph Ledwinka receives U.S. patent no. 2,000,000 for "Vehicle Wheel Construction," a pneumatic tire for rail cars. Art of animation Walt Disney receives U.S. patent no. 2,201,689 for "art of animation," ushering in modern animated motion pictures. Hedy Lamarr During Hollywood’s Golden Age, Austrian-born actress Hedy Lamarr moonlights as an inventor. With composer George Antheil, she patents a technique of hopping radio signals from frequency to frequency to help radio-controlled torpedoes evade detection and jamming. The work is ahead of its time and contributes to the development of advanced wireless communications. Richard James receives U.S. patent no. 2,415,012 for a "toy and process of use." The Patent Act of 1952 clarifies and reorganizes patent law while incorporating several substantive additions. Anyone up for a game of hockey? Frank Zamboni receives U.S. patent no. 2,642,679 for his eponymous "ice rink resurfacing machine." Physicist Enrico Fermi receives U.S. patent no. 2,708,656 for the "neutronic reactor," a seminal development in nuclear power generation. Kenneth Eldredge receives U.S. patent no. 3,000,000 for an automatic reading system that converts human language into machine-readable language. Harold Froehlich receives U.S. patent no. 3,104,641 for an "underseas vehicle." The submarine "Alvin" allows scientists to dive to 14,000 feet, enabling the discovery of over 300 new animal species. Crash test dummy Samuel Alderson receives U.S. patent no. 3,010,223 for a "human Equivalent dummy." The crash test dummy helps greatly improve vehicle safety. Timothy Eddins receives U.S. patent no. 3,224,336 for a "missile launch release system." Used on the Saturn V rocket, this system is part of a series of patented inventions created at NASA to send astronauts to the moon. The United States signs the Patent Cooperation Treaty, which provides a unified procedure for filing patent applications in each of its contracting countries. Computer mouse Douglas Engelbart receives U.S. patent no. 3,541,541 for " X-Y position indicator for a display system," also known as the computer mouse. Waffle tread William Bowerman receives U.S. patent no. 3,793,750 for "Athletic shoe for artificial turf." The shoe’s "waffle" indentations provide improved grip and become a common feature in sneaker design. What's in a name? The Patent Office is renamed the United States Patent and Trademark Office. 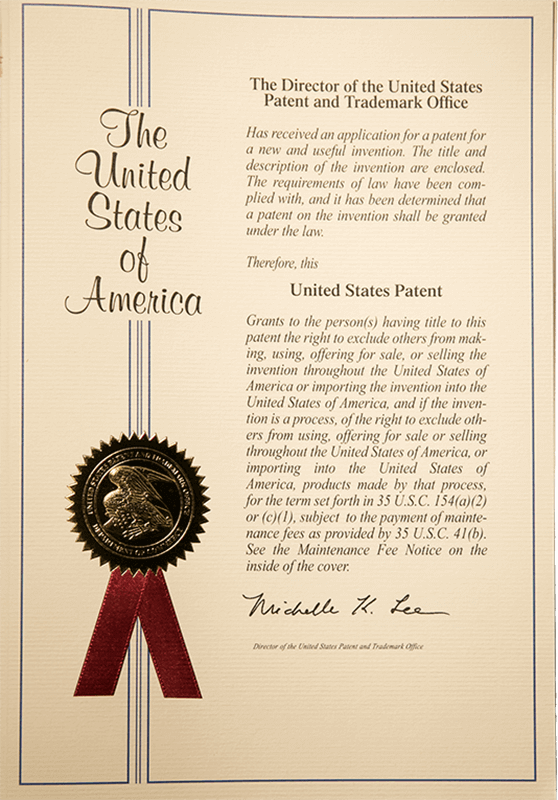 Robert Mendenhall receives U.S. patent no. 4,000,000 for a "process for recycling asphalt-aggregate compositions." 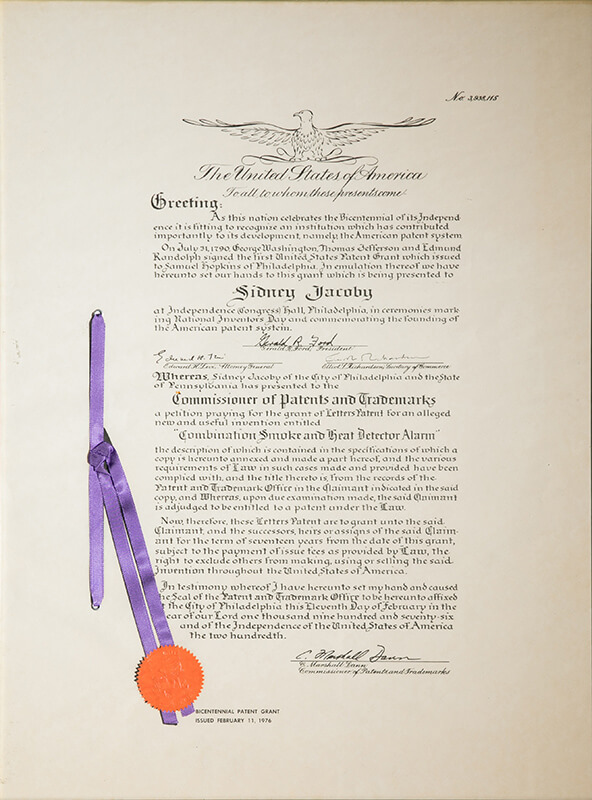 Signed by President Gerald Ford, this one-of-a-kind, hand-inscribed patent is granted to Pennsylvania inventor Sidney Jacoby as part of celebrations of the nation’s bicentennial. This is the last patent known to be signed by a U.S. president. Athletic brassiere Hinda Schreiber, Eugenie Lindahl, and Polly Smith receive U.S. patent no. 4,174,717 for an "athletic brassiere," the first patented sports bra. Congress passes the Bayh-Dole Act, giving universities, small businesses, and nonprofits more control over their innovations resulting from federally funded research. Don Arney receives U.S. patent no. 4,474,245 for a "collapsible fire bucket," which allows fire-fighting helicopters to fight forest fires. 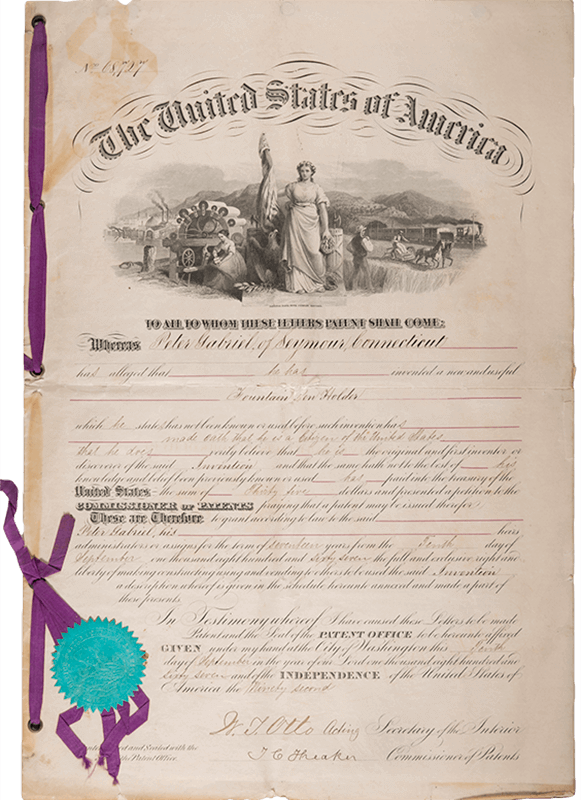 The most-recognized U.S. patent cover design comes into use, adorning more than five million issued patents. Lonnie O. Ingram, Tyrrell Conway, and Flavio Alterthum receive U.S. patent 5,000,000 for creating a means to use E. coli bacteria to produce ethanol. Jeffrey C. Hawkins and Michael Albanese receive U.S. patent no. 6,000,000 for a method of synchronizing files between computers. Mary-Dell Chilton et al. receive U.S. patent no. 6,051,757 for "Regeneration of plants containing genetically engineered T-DNA." Her research leads to the first transgenic plants and the foundation of modern plant biotechnology. Raymond Kurzweil receives U.S. patent no. 6,199,042 for a reading system that recognizes images of text and uses a computer to read the text aloud. The USPTO begins moving to its current headquarters in Alexandria, Virginia. John P. O’Brien receives U.S. patent no. 7,000,000 for inventing strong, biodegradable, low-cost textile fibers from polysaccharides. iPod Steve Jobs receives U.S. patent no. 7,166,791 for "Graphical user interface and methods of use thereof in a multimedia player," which allows users to navigate the Apple iPod. Robert J. Greenberg, Kelly H. McClure, and Arup Roy receive U.S. patent no. 8,000,000 for a "visual prosthesis" for people who have gone blind due to retinal degeneration. The Leahy-Smith America Invents Act is signed into law, bringing several changes to U.S. patent law and transitioning it from a "first-to-invent" to a "first-inventor-to-file" system. Matthew Carroll receives U.S. patent no. 9,000,000 for a "windshield washer conditioner," which collects rainwater from a car’s windshield and recycles it for cleaning the windshield. The USPTO redesigns the patent cover in preparation for the issuance of patent number 10 million. The new design, an homage to the classic elegance of its predecessors, is unveiled on March 11 and, starting with U.S. patent no. 10,000,000, is issued with all patents.